Join us for a great opportunity to hit a ball, get competitive and have a laugh... There will be endless challenges and awesome prizes! 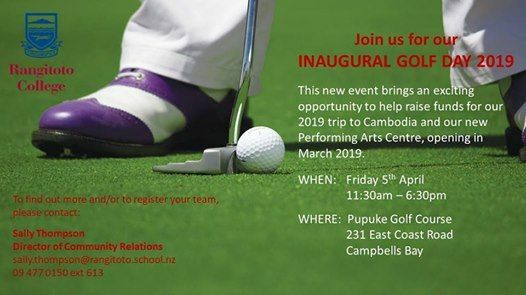 Golf will be played in Ambrose format with a lunch pack, drinks and post-event nibbles provided! Teams of 4 @ $125 per person or $500 for a team… If you’re keen but don’t have a team, no problem, we’ll sort out some mates for the day! 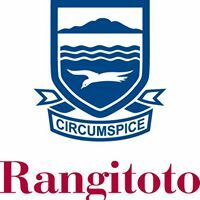 Grab your boss, round up your colleagues, old school mates and friends and support Rangitoto College. 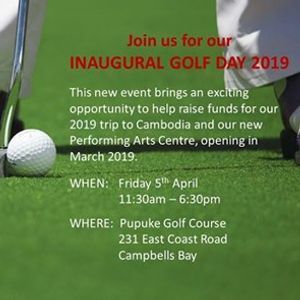 All funds raised will go towards our Cambodia Trip (students will be building their 100th house) and the NEW Performing Arts Centre, opening in March! NUMBERS ARE LIMITED SO REGISTER NOW!!! Email c2FsbHkgISB0aG9tcHNvbiB8IHJhbmdpdG90byAhIHNjaG9vbCAhIG56 to register your team (or just yourself).